Ace McCoy is an adventurer. According to his moniker, he is a "famous adventurer of the air". Furthermore, he and his partner are "the fastest flying brain-and-brawn combination that ever streaked through the skyways of the world in search of adventure." His partner is Bill Regan, master mechanic and pal who follows McCoy everywhere and does everything that McCoy does but does not get star billing (obviously needs a better agent). McCoy undoubtedly get the lead role because he is exceptionally handsome with a full head of gorgeous blond hair constantly immaculate and in place. This is impressive because McCoy is above all else quite impetuous and leaps into action at the drop of a hat he never wears. Luckily McCoy is a darn good fighter because he will, and frequently does, engage in fisticuffs with, well, everyone. 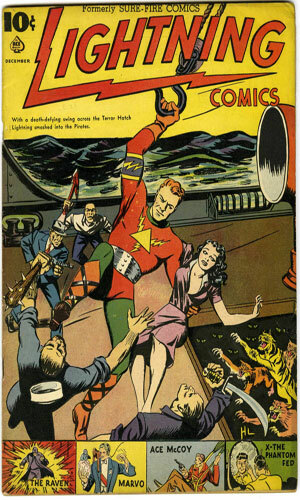 In the first issued adventure, he feels it necessary to forcibly subdue some Coast Guard personnel (i.e., beats them up) when they will not lend him a plane to chase some bad guys. Gosh, he needed a plane, they had a plane, they did not give him the plane so he had to bop them a few times. Apparently he is such a good guy that they did not feel it necessary to arrest him when he got back. McCoy is also very resourceful although it helps when the diabolical enemies are often incredibly gullible. Yes, I know you want to shoot me but I have some priceless gems in this here medicine cabinet. Get them for you? Sure! Oh, here's some ammonia to distract you. That kind of resourceful. McCoy, however, does not seem to understand finances or at least he chooses to ignore some aspects of his escapades. In one instance, to recover $200k, McCoy destroys two planes and a hi-tech research balloon, all worth considerably more than the money he were rescuing. As part of being a freelance adventurer, McCoy is available for work anywhere and anytime. The U.S. government likes that and makes use of him on several occasions. At least they do not seem to mind his wrecking a lot of planes. 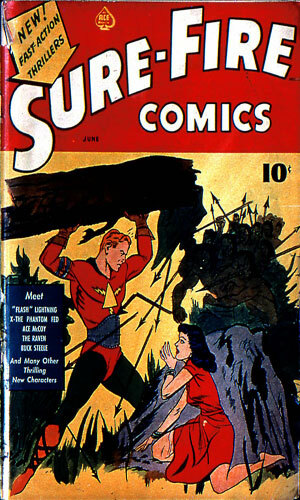 Ace Magazine started a new publication called Sure-Fire Comics in June, 1940. It ran for four issues under that name although #3 and #4 were both listed as Volume 1 Number 3 in the indicia. 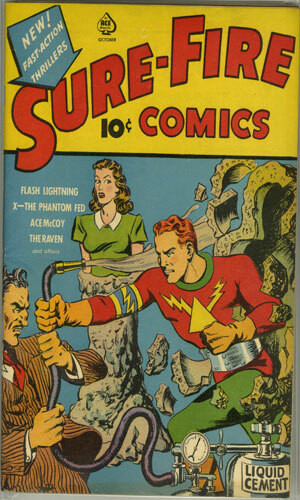 The lead character for each of these was Flash Lightning, a superhero with small lightning bolt radiating from a pyramid as his chest decal..
To capitalize on the lead, the name of the comic was changed to Lightning Comics and ran another 10 issues. One of the extra series in the comic was that of Ace McCoy (first name a coincidence? I think not). Note: the titles given to each issue are my own inventions. 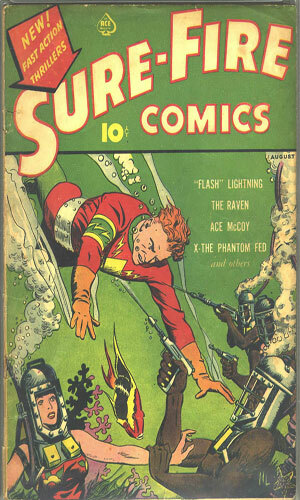 From Sure-Fire Comics #1 - While on vacation in Florida, Ace McCoy spots one fighter plane shooting down another. The deceased downed pilot had on him a partial log from US ship missing for two decades. The action takes him to the Sargasso Sea and a hidden U-Boat refueling station. From Sure-Fire Comics #2 - A shipment of planes bound for Brazil goes missing and Ace McCoy is dispatched by Washington to learn what is up. He encounters a gang of German agents who are going to use the planes to disrupt the American fleet. From Sure-Fire Comics #3(a) - A shipment of planes bound for Brazil goes missing and Ace McCoy is dispatched by Washington to learn what is up. He encounters a gang of German agents who are going to use the planes to disrupt the American fleet. 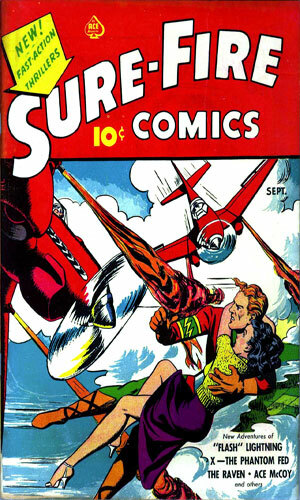 From Sure-Fire Comics #3(b) - A major warplane manufacturer has sent via ship a new bomber airplane to a Central American nation. With rebels having seized the government, the CEO wants Ace McCoy to make sure the plane does not fall into their hands. From Lightning Comics #4 - Seeing a personal ad in the paper asking for flyers for a dangerous job, Ace McCoy and Bill Regan respond. The job is to fly to Long Island and locate a buoy for a woman named Madame Z. Bad guys want the buoy as well and will do anything to stop them. 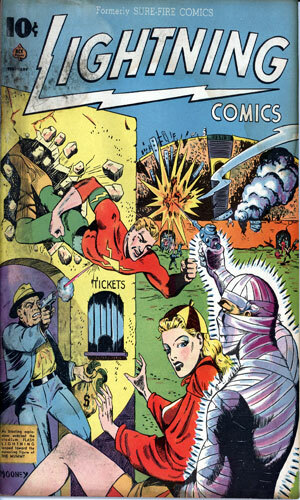 From Lightning Comics #5 - A young movie star, Billy Baird, has been kidnapped and Ace McCoy and Bill Regan have been hired to deliver the ransom money in a remote location. Well, since Ace McCoy (first name never given unless it really was his given name) did not hang around too long, it is hard to get to like him. That and his stories really stretch the bounds of what might be believable even in the pages of a comic about superheroes. Mostly, though, I am still hung up on the fact that Bill Regan does everything that Ace McCoy does (except start the fighting) but he does not get anywhere like the accolades. At least McCoy seems to recognize his pal's importance. Everyone else just looks at the literal fair-haired boy and goes nuts for him. I read these stories because, well, they were there to be read and that is what I do but I would not have paid anything to do so and maybe that is why he did not stick around long. Or maybe Regan said 'so long' and ... never mind.